Honestly, it’s a wonder that there are any shipping containers left for the ships. When Riley’s Fish Shack and Anna Hedworth’s Cookhouse used a couple apiece to open their businesses it had just a whiff of underground cool and felt a bit edgy. 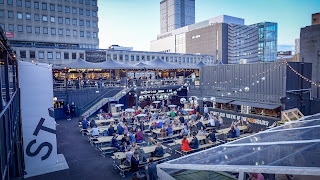 When By The River Brew Co opened up earlier this year it was as if the whole “not quite permanent” concept had been weaponised, to very good effect. With the advent of Stack, on the site of the former Odeon Cinema, shipping containers have gone full-blown mainstream. Give it a couple of years and we’ll all be living, working and loving in shipping containers. Watch out, Maersk. Stack is brought to you by Danieli Holdings, who run security and health care businesses, as well as their leisure portfolio. This is not an uncommon situation, and I do always wonder whether organisations with fingers dangling in so many pies can have real enthusiasm or love for the one that I do, namely restaurants. As far as I’m aware, my previous experience of their work is limited to a visit to YOLO on High Bridge in Newcastle. The meal I endured there was one of the most abrasively and cynically poor I can recall, so it’s fair to say my expectations for Stack were not in the stratosphere. Nonetheless, I’m happy to report that over the course of a full evening’s eating we were able to locate things to enjoy and recommend. Once you’re in, the place operates like a sort of large double decker food court. 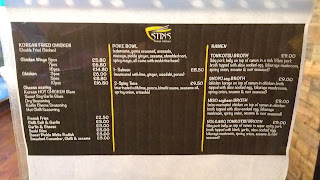 There are a couple of capacious bars at ground level and a few food outlets, but most of the eating action is upstairs. There are communal tables dotted around all over the place. You have to make a “substantial food order” in order to get a drink upstairs, a strangely vague diktat from the licensing authorities, I presume. This, in any case, proved not to be a problem for us. We ordered a ton. 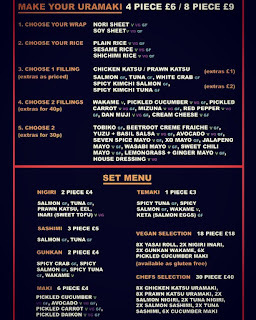 We started with what the consensus on Twitter had told me was Stack’s gastronomic highlight, Sushi Me Rollin’. 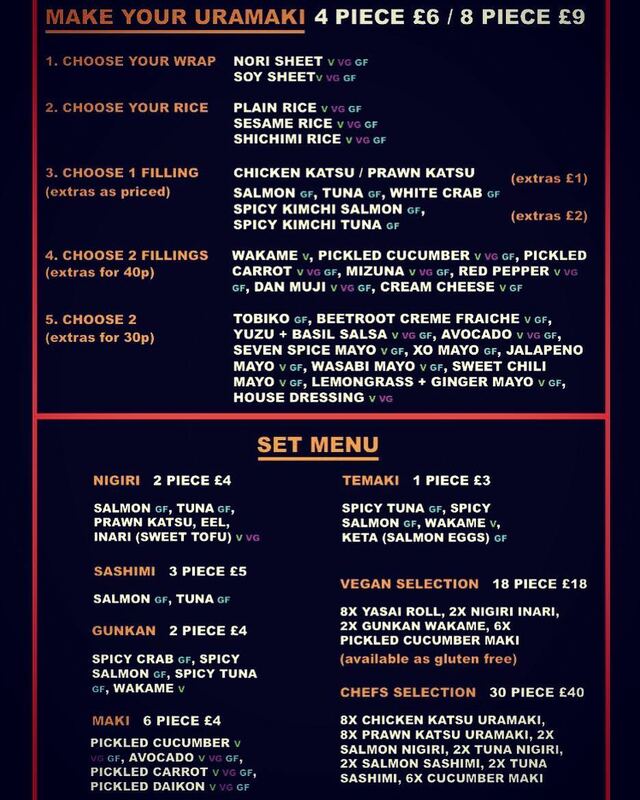 I’m not loving that name, but I am loving their beautifully presented plates of sushi and sashimi, made to order using good quality ingredients and an imaginative array of seasonings and flavourings. Classic nigiri-only sushi this is most definitely not, but it’s the best I’ve had in Newcastle; not altogether surprising from a team featuring chefs formerly plying their trade at Aveika and Peace & Loaf. 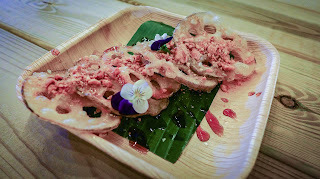 Spicy crab gunkan were particularly enjoyable, and thumbs up for using the gorgeous plates produced in Ouseburn by 1265° North, too. 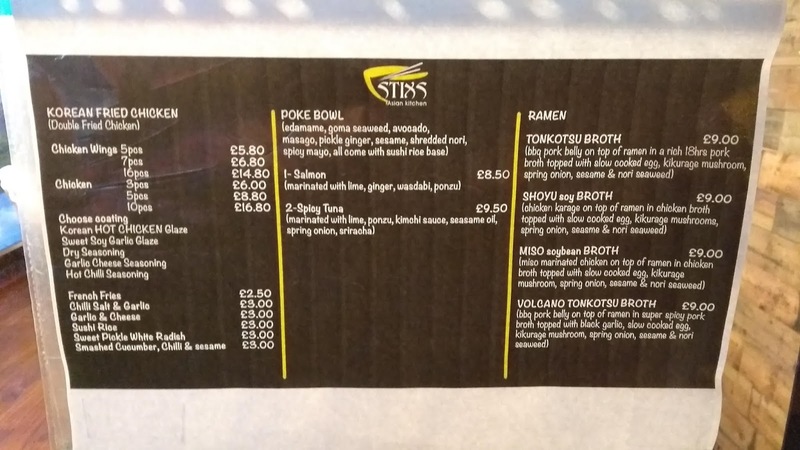 The other highlight was a terrific punnet of tonkotsu ramen broth served up by Asian contender Stixs. 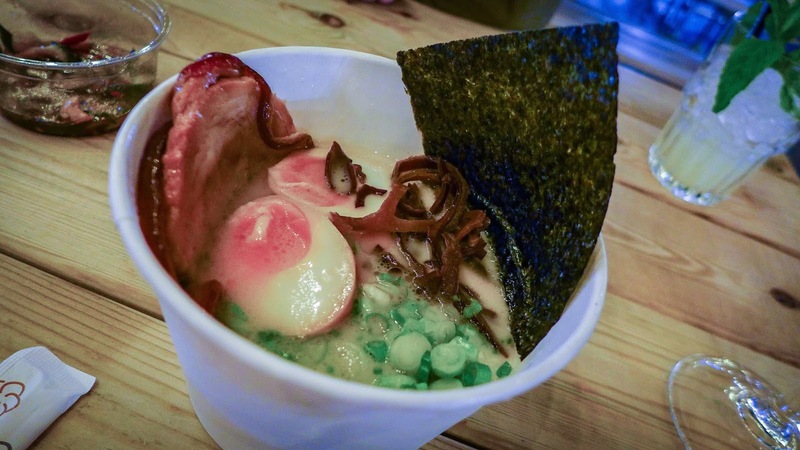 The noodles themselves were unremarkable, and although I appreciated the canonical garnishes of nori seaweed, slow cooked egg and wood-ear mushrooms, it was the broth itself that floored me. A hell of a lot of pork bones must have been cooked for an awful long time to produce this wondrous cloud-milky lotion, almost closer to a gravy than a soup. Unquestionably I’ll be back for another dose of this particular cure-all. 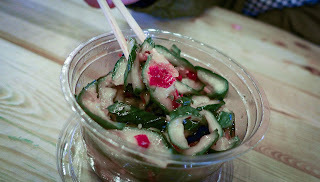 Great smacked cucumber salad too. The standard narrative is that 'food villages' like Stack allow would-be restaurateurs to try out ideas before casting their dreams in bricks and mortar. I wonder if it is a sign of the times in restaurant-land that at least a few of the operators here are moving in the opposite direction. The folk behind Stixs used to run Tenji on Barrack Road before it closed. Lost and Found Social, our next port of call, is by Lulu Chai who had Lost and Found on Heaton Road before the shutters came down on that venture a few months back. 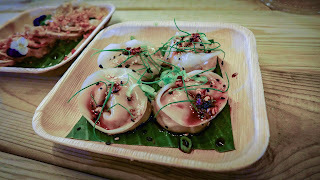 The fried lotus root with peanut and chicken dumplings I had enjoyed there previously have made it to Stack, and they’re both still rather lovely; homely flavours but attractively presented. 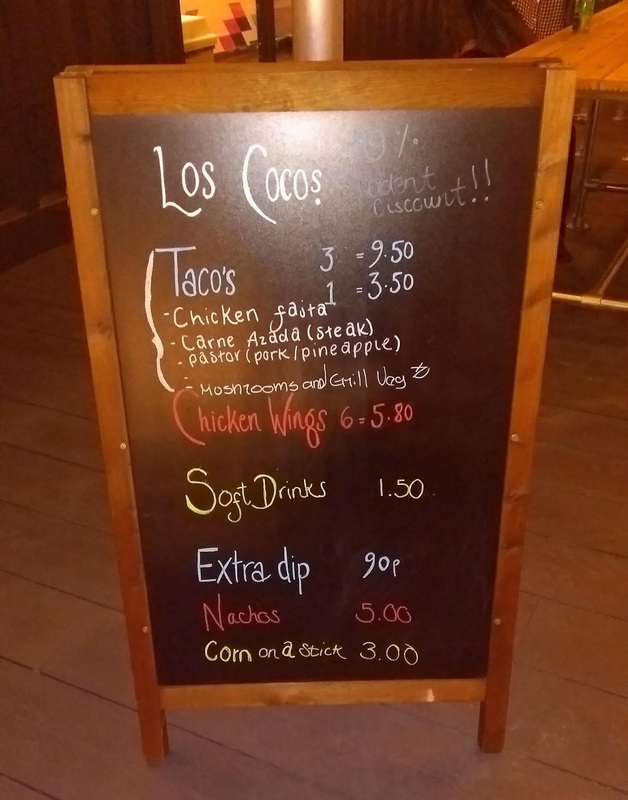 We studiously avoided a few outlets who, naming no names, looked like they had spent more time on their branding than on figuring out how to prepare and serve tasty food. We did however encounter a couple of bum notes. 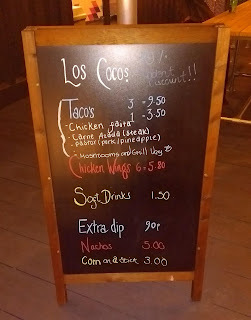 The tortillas for Los Cocos’ tacos were delicious, bursting with a really pronounced corn flavour which made it a bit of a shame that none of the three fillings we tried were much cop. 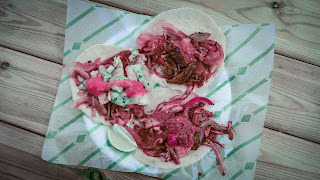 In particular, the steak in the carne asada was almost indigestibly tough. 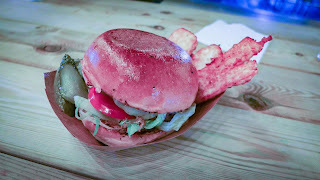 And the offering from Beacon Burgers was just bang average, lacking seasoning, beefiness and with far to much dull salad stuff in the bun. I thought it only fair to give them another try by procuring our beverages from their bar, but here the curse of YOLO struck again. My Aperol spritz was very heavy on the (soda water) spritz and very light on both the Italian apéritif and prosecco. Mrs Diner had the car keys so she went for a mocktail of some sort which was eye-poppingly astringent. Come on guys, you can do better than this. 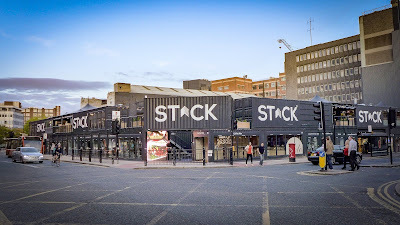 There are a few retailers taking up residency in the units around the outside of Stack (a "creative social hub for entertainment, culture, work and play") that look interesting to these eyes, and a number that really don’t. 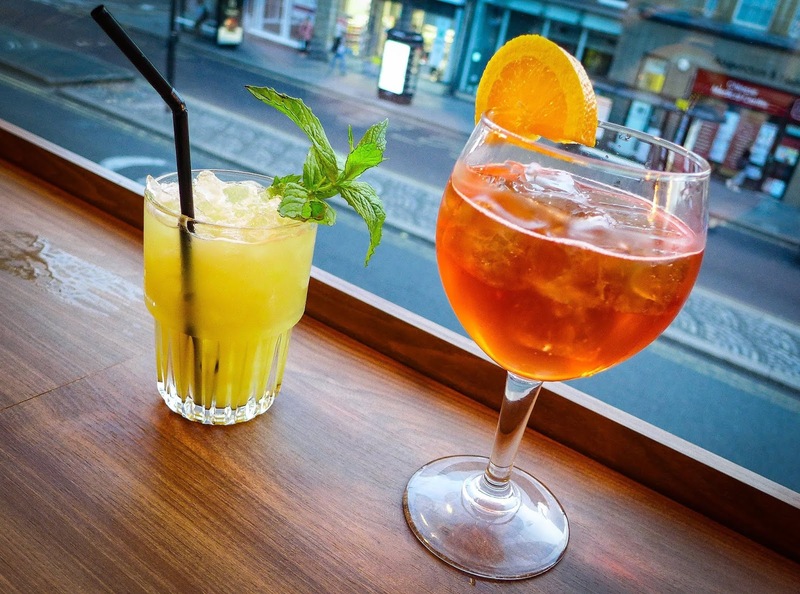 Of the former variety, Fourteen Drops is a Yarm-based wine shop that is likely to be well worth a look. There aren’t a great number of places to buy interesting wine in Newcastle City Centre, so their presence is welcome. I have mixed feelings about Stack. On the food and (especially) drinks front it’s a pretty poor facsimile of the Wylam lot’s venture down on the Quayside, particularly Träkol. It feels like the target clientele are those who’ve vaguely heard that this kind of thing is cool, but who won’t themselves notice that this particular version really isn’t. Evidence? The music. Jaysus, the music. They were playing “Closer” by Ne-Yo, and some grim dance remix of a Lighthouse Family tune during our visit. Also, it can be pricey. 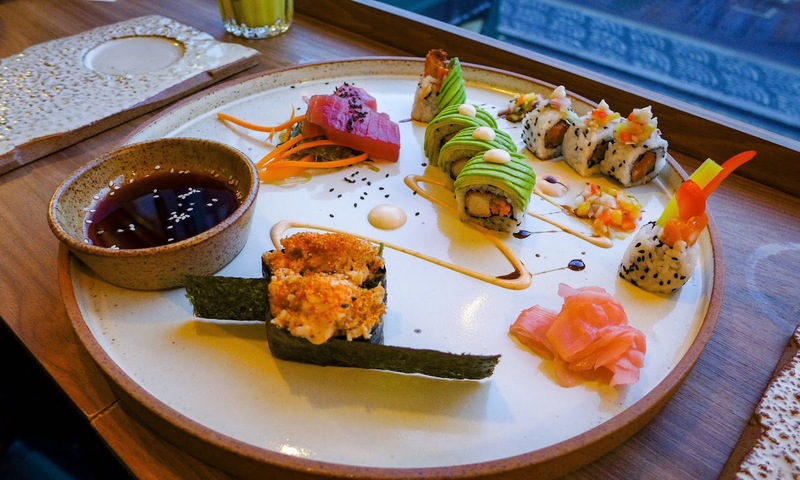 I didn’t mind paying £21 for the sushi; fresh fish is expensive, and so are those lovely plates. A tenner for four small dumplings and some lotus root from Lost and Found, and a touch less for that burger, both served on things you will be lobbing in the recycling bin? Not so much. On the other hand, there are at least a couple of diamonds among the rough in there, and it sure beats the hell out of the demolition site it has replaced. I assume that it makes an awful lot of sense for everyone involved too, from the vendors to the owners, to the Council’s planning department. 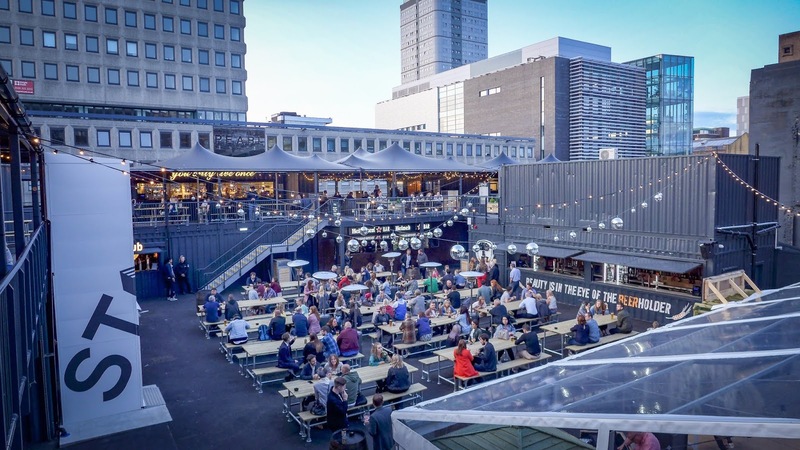 It isn’t quite for me - I like my shipping containers with a side order of boundary-pushing beer and a view of the Tyne Bridge - but I’m big-hearted enough to be glad it’s here.